Jane Henry worked in the oil and gas industry for 15 years and noticed a problem facing women in her career: Protective clothing that doesn’t fit. She finally decided to do something about it when her unisex glove came flying off while rebuilding her home after Hurricane Harvey. So, she created SeeHerWork, a clothing company that sells personal protective clothing and equipment for women in construction and engineering. Instead of women in hard labor and in the STEM field risk getting hurt because of ill-fitting clothing, SeeHerWork creates work clothes based on women’s measurements, helping women feel confident and safe when they go to work. Read more. Mark Fleming, a personal trainer with autism, recently opened Puzzle Piece Fitness, a safe space for people with special needs who are looking to get healthy. Fleming was inspired to open the gym when he volunteered for the Special Olympics and noticed that outside of the games, there was a lack of opportunities for special needs athletes to practice and exercise. Fleming is happy with the endeavor so far, saying,“Just seeing individuals get healthy, it’s awesome – the healthier these individuals are, the more likely they are to live their best lives.” Read more. There’s always that one friend who feels more like family, but in the case of two friends from Pennsylvania, it was more than just a feeling. Suzanne Keller and Debra Wisor have been friends for 15 years. They first met when Susie, a swim coach, began coaching Deb’s son. The two grew even closer when Susie was injured in a car accident and Deb began driving her wherever she needed to go. Susie returned the kindness, taking care of Deb when she was diagnosed with breast cancer. They didn’t think their bond could get any stronger, that is, until Susie took a 23andMe DNA test and Deb’s son came up as a relative. After some research, the pair discovered they’re actually third cousins! They say that they’ve always considered each other family, but now they really are. Read more. Florida brothers Michael and Christopher Ferry wanted to do something special for their father, who lives in New Jersey, for his birthday. So, they announced their dad’s special day in a big way: on a billboard in Atlantic City. 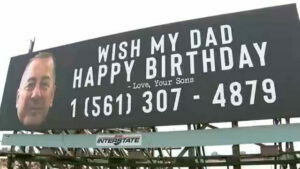 The roadside sign featured their father’s face, his phone number, and a request for people driving by to tell their dad “happy birthday.” Chris, whose birthday is on March 16th, has been flooded with messages from kind strangers who want to wish the “billboard dad” happy birthday. Read more. About one year has passed since the first 3D-printed home was revealed in Austin, Texas. The printer took just 24 hours to build the house, and now, it has been redesigned to build homes for poor families. New Story, a Silicon Valley-based nonprofit, has begun constructing a neighborhood in Latin America consisting of 3D-printed homes for families who make less than $200 a month. The printer constructing the neighborhood, Vulcan II, is commercially available to produce affordable and resilient housing. Read more.